So as poor Willie lay dying on the ground the spring water gushed out. Another story says that he fell to his knees on at the site and prayed for water and so the spring arose. This is a common folk motif and can be seen in many counties. An alternative origin of the name is given by Rosemary Robb in her Ghosts and Legends of Newark (1989) that the soldier was called Willie Rundle escaping the slaughter of East Stoke was ambushed here and thrown from his horse, and a spring arose where he landed. Another theory, I was told locally is that the name derives from the fact that willow stakes were used topiece the heart of the rebels and they were buried by the spring. Whatever the true it is more likely that the name derives from the presence of willows at this watery site and the word Rundle probably derives from Runnel a word for stream. The spring has a copious flow; it never dried in the drought of 1976, but is often quite overgrown. 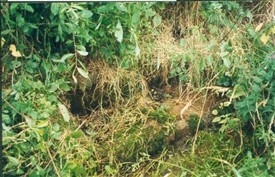 Although not marked on the O/S map it is easily found and fills a damaged three foot long rectangular stone trough which overflows through a gap into the ditch. The water is said to be sweet and famed for medicinal properties. There is an old chapel at Elston which some authorities believe was a leper hospital and as such this site may have been associated with that. Unfortunately, upon the building of the new A46, the spring has now been compromised, and no longer flows. The Newark Archaeological & Local History Society did try to save it prior to roadworks starting, but...........! Thanks for the information and effort, pity about the loss of the source. Doesn't surprise me, springs are low on the priority in preservation during building works etc. It may be possible to relocate the spring at a latter time at least the trough survives.